Irish Political Maps: Who's not running in the 2016 general election? Who's not running in the 2016 general election? Every general election sees some TDs announcing their retirement from politics (at least, from the domestic side of it). In the months before the 2011 general election, 39 TDs announced they were stepping down - 22 of them from Fianna Fáil. 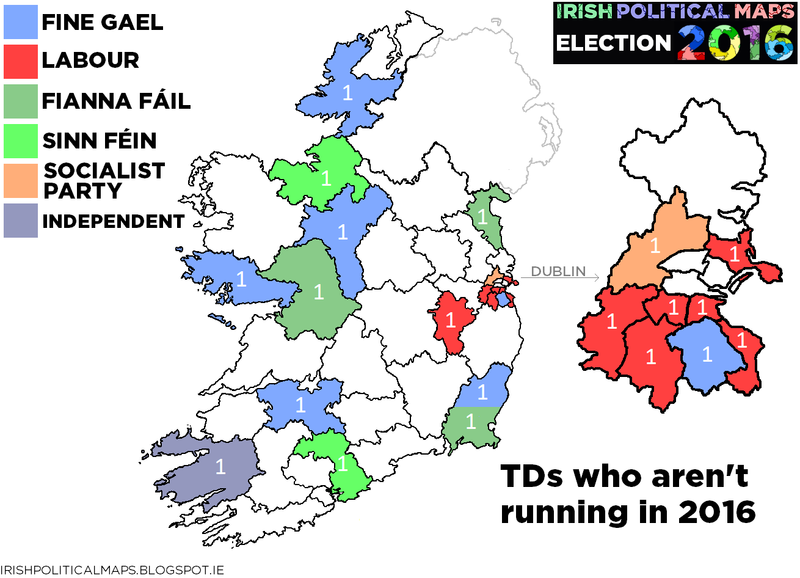 So far, 19 TDs have stated that they will not run in the next general election, on 26 February. Of the twelve to step down so far, seven are from the Labour Party, six from Fine Gael, three from Fianna Fáil, two from Sinn Féin and one from the Socialist Party. The longest serving TD to be stepping down is Labour's Ruairi Quinn, who was first elected in 1977.